I love a good flourless cake! The texture, the density. My usual ‘go to’ cake recipe is a rich flourless chocolate cake (I’ll have to share the recipe soon), and also my Beetroot and Chocolate Cake. Yum! But for the times I don’t feel like chocolate, rather something a little more fruity, this Blood Orange and Blackberry Vanilla Cake is the recipe I turn to. 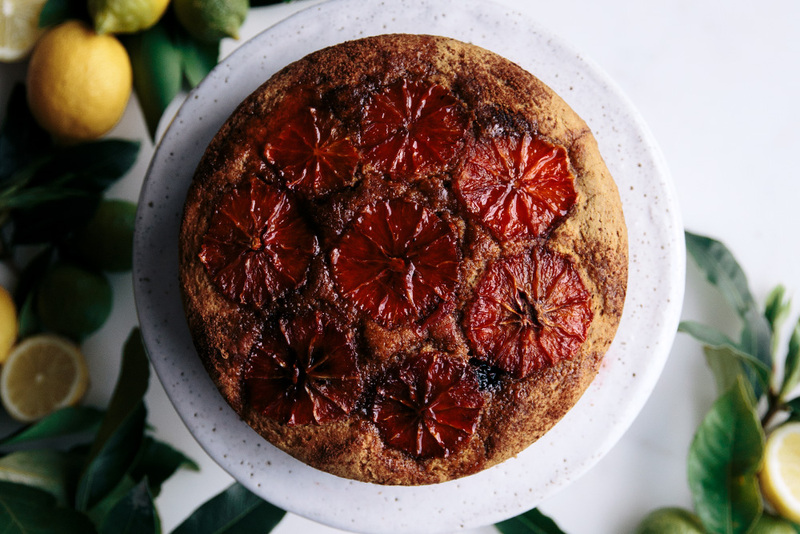 This recipe is not as intense as a normal orange flourless cake, because it doesn’t use whole oranges like most do. This is I guess, more of a tea cake, with a dense crumb and crispy crust. Now, while testing this recipe I discovered that during the cooking process, the oranges on the top of the cake can sometimes sink to the bottom. This is sad, as the pretty orange pattern on top disappears, but in its place, it leaves a deliciously crunchy crusty top, like a giant muffin top (always the best part!). I personally think this is a great compromise and I usually go a crispy top, but for the look of this cake I wanted the pretty orange look. If you prefer ‘pretty oranges’ over a ‘crispy top’ you will need to lay the oranges gently oven the top of the cake halfway through the baking process by opening the oven halfway through baking (normally a big no-no). This reduces the risk of the oranges sinking as the cake is already partially cooked. Both are delicious! I’ll leave it up to you. Grease and line a 20cm springform cake pan and set aside. In a large mixing bowl, cream the butter and sugar together until smooth. Add the eggs one at time, beating well between each addition. Fold in the almond meal, potato starch, bi-carb soda, baking powder, vanilla, orange rind and juice. Pour the mixture into the prepared cake tin and arrange the orange slices and blackberries on top. Next sprinkle ¼ cup coconut sugar evenly over the top of the cake. Bake in the pre-heated oven for 50 minutes to 1 hour or until a skewer inserted into the cake comes out clean. Remove the cake from the oven and set aside for 5-10 minutes. Remove the cake from the tin and place onto a serving plate. Pour the juice of two blood oranges (or oranges), maple syrup (or coconut sugar), and vanilla into a small saucepan and bring to a simmer. Simmer for 2-3 minutes, then remove from the heat. Pour the warm syrup over the warm cake and serve with natural yoghurt and fresh mint. Enjoy! I LOVE long lunches spent lounging outside in the fresh air on a warm sunny day. The main feature in this week’s new recipe is delicious chai soaked fruit. To celebreate my birthday I created this delicious chocolate and beetroot cake with a cacao fudge frosting!